(Nanowerk News) A potential avenue to quantum computing currently generating quite the buzz in the high-tech industry is "valleytronics," in which information is coded based on the wavelike motion of electrons moving through certain two-dimensional (2D) semiconductors. Now, a promising new pathway to valleytronic technology has been uncovered by researchers with the Lawrence Berkeley National Laboratory (Berkeley Lab). Feng Wang, a condensed matter physicist with Berkeley Lab's Materials Sciences Division, led a study ("Ultrafast generation of pseudo-magnetic field for valley excitons in WSe2 monolayers") in which it was demonstrated that a well-established phenomenon known as the "optical Stark effect" can be used to selectively control photoexcited electrons/hole pairs - referred to as excitons -in different energy valleys. In valleytronics, electrons move through the lattice of a 2D semiconductor as a wave with two energy valleys, each valley being characterized by a distinct momentum and quantum valley number. This quantum valley number can be used to encode information when the electrons are in a minimum energy valley. The technique is analogous to spintronics, in which information is encoded in a quantum spin number. "This is the first demonstration of the important role the optical Stark effect can play in valleytronics," Feng says. "Our technique, which is based on the use of circularly polarized femtosecond light pulses to selectively control the valley degree of freedom, opens up the possibility of ultrafast manipulation of valley excitons for quantum information applications." Wang, who also holds an appointment with the University of California (UC) Berkeley Physics Department, has been working with the 2D semiconductors known as MX2 materials, monolayers consisting of a single layer of transition metal atoms, such as molybdenum (Mo) or tungsten (W), sandwiched between two layers of chalcogen atoms, such as sulfur (S). This family of atomically thin 2D semiconductors features the same hexagonal "honeycombed" lattice as graphene. Unlike graphene, however, MX2 materials have natural energy band-gaps that facilitate their use in transistors and other electronic devices. This past year, Wang and his group reported the first experimental observation of ultrafast charge transfer in photo-excited MX2 materials. The recorded charge transfer time of less than 50 femtoseconds established MX2 materials as competitors with graphene for future electronic devices. In this new study, Wang and his group generated ultrafast and ultrahigh pseudo-magnetic fields for controlling valley excitons in triangular monolayers of WSe2 using the optical Stark effect. "The optical Stark effect describes the energy shift in a two-level system induced by a non-resonant laser field," Wang says. "Using ultrafast pump-probe spectroscopy, we were able to observe a pure and valley-selective optical Stark effect in WSe2 monolayers from the non-resonant pump that resulted in an energy splitting of more than 10 milli-electron volts between the K and K' valley exciton transitions. 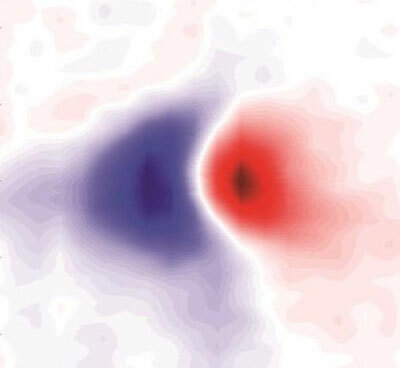 As controlling valley excitons with a real magnetic field is difficult to achieve even with superconducting magnets, a light-induced pseudo-magnetic field is highly desirable." Like spintronics, valleytronics offer a tremendous advantage in data processing speeds over the electrical charge used in classical electronics. Quantum spin, however, is strongly linked to magnetic fields, which can introduce stability issues. This is not an issue for quantum waves. "The valley-dependent optical Stark effect offers a convenient and ultrafast way of enabling the coherent rotation of resonantly excited valley polarizations with high fidelity," Wang says. "Such coherent manipulation of valley polarization should open up fascinating opportunities for valleytronics."